[tantek] Why is this only a problem with benwerd and superfeedr? [tantek] Or is it any Known and he happens to say "IndieWeb"? [jeremycherfas] It isn’t just benwerd. I have sometimes seen the same thing from my Known. sknebel and how many of the sucessful ones started small? jeremycherfas I'm too busy trying to set up an alternative to read everything, so thanks zegnat and sknebel for posting those goodies. dgold what alternative are you tending towards, jeremycherfas ? jeremycherfas I think Stripe. The site is WP, and there is what seems like a good plugin. Need to pay for pro, but will be worth it, I think. And hope. jeremycherfas Thanks. I'm hoping audio will improve when it gets going for real. jeremycherfas Nope. Watching on Chrome. chrisaldrich I've heard aaronpk, schmarty, tantek, and GWG in the background; who else is there that's in chat? chrisaldrich Hows the weather out there Tom? tbbrown nice and cool. no snow expected today. schmarty [manton] is kicking off IWC Austin! schmarty [manton]: we'll be starting w/ intros and demos, then building blocks. chrisaldrich GWG++ for notetaking and using using /me for the editorial parts! [chrisaldrich] Who is Aaron Parecki? schmarty next up: tom brown. schmarty latest thing: at indieweb summit learned to do micropub with jekyll. documented it recently. GWG He's hoping to learn about WordPress this weekend. GWG Is interested in the infrastructure for online publishing. GWG Next is Chris Grayson, very new to the Internet. chrisaldrich Indivisible is http://indivisible.blue/ a free [[WordPress]] hosting company for the #resistance. GWG Where are the Hello My URL is nametags? GWG Been trying to post to his website first and syndicate for a few years now. GWG Typical microblogging type stuff that gets syndicated. schmarty previously: Althea (not sure about my spelling, apologies) also currently has no website, but has used wordpress. interested in learning more and getting a site going. schmarty next up, aaronpk is back up. reviewing the schedule. GWG Topics to be discussed. GWG If you llook at a cross section of people's website, they usually have the person's name, sometimes photo, often About/Bio, and then as we get into more social...a list of posts. It could be blog posts, or it could be things like microblog posts, photos, and other crazy stuff and experimental posts. GWG 3. The next step is you can use your website to log into things, like our community wiki. If you try, it will ask you for your domain name, and it will give you ways to authenticate through other services. It did this because on his page, there is a little markup(rel=me) that allows a website to interpret what other profiles/services can be used to sign you in. GWG 4. The next popular thing is microblog posts/notes. We are seeing this because Twitter introduced the idea of posting short things without a title. GWG Webmentions allowed his site to notify the other site that there was a mention of it. Microformats allows the other site to interpret the comment. GWG The way to turn it on. chrisaldrich The /Known has them built into the core of the CMS. GWG Webmention.io is a service where you copy two lines into your site header that handles webmentions and has an API to pull them out. GWG Shows off minimal hcard by adding h-card to a link. chrisaldrich What is a parser? GWG aaronpk has no posting interface for his site. GWG His admin is small. GWG Quill tries to know how to sign you in, how to get credentials, and where to send posts. GWG Creates a post. Shows Syndication targets, location, etc. GWG A few people mentioned OwnYourGram/Swarm. They are also Micropub apps. Loqi [Aaron Parecki] Hello from IndieWebCamp Austin! GWG Instead of posting notes, they post checkins/photos posted to those services back to your site. GWG aaronpk demoes OYG to Micro.blog and Known. GWG Another example is the micro.blog iOS app. GWG One of the reasons that linking to Twitter is useful is that we want to show his reply on Twitter as a comment on our site. schmarty tantek: Together is talking to Monocle over microsub, yep. chrisaldrich I've been quietly following the /microsub updates for a while... EXCITING stuff right?!!!! GWG Why Cell Phone Battery? schmarty aaronpk shows some of his extra features. his website always knows his location. tantek when is IWC Austin? GWG What is duck boat? gRegorLove If notes already exist in the etherpad for previous sessions, enter a few line breaks at the top and enter the newer notes at the top. GWG What is a wiki? aaronpk_ what is a wiki? aaronpk_ what is a photo? tantek you can ask "what is..."
aaronpk_ what is a bot? 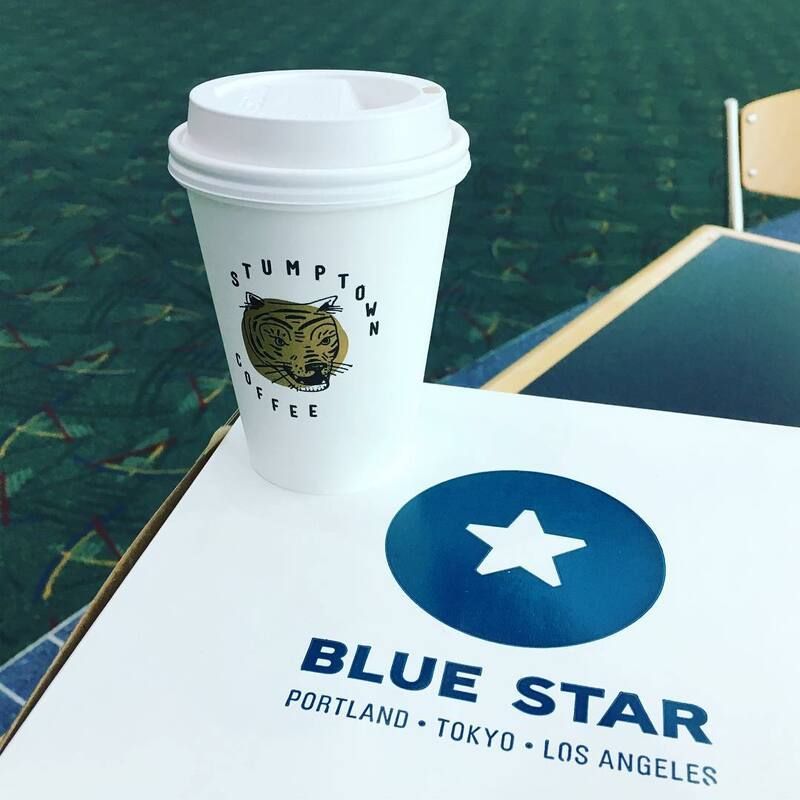 aaronpk_ what is Blue Star? tantek what is a breakfast taco? GWG #indieweb is for user level discussions, #indieweb-dev is for protocol and development stuff, #indieweb-wordpress is for WordPress specific questions and avoid GWG annoying everyone..
gRegorLove Is there video for Johnny Five room? tbbrown what is the hashtag for micropub lifecycle? gRegorLove tantek: heh, request in etherpad to point video at screen. chrisaldrich XingcodeD3D what do you need help with? 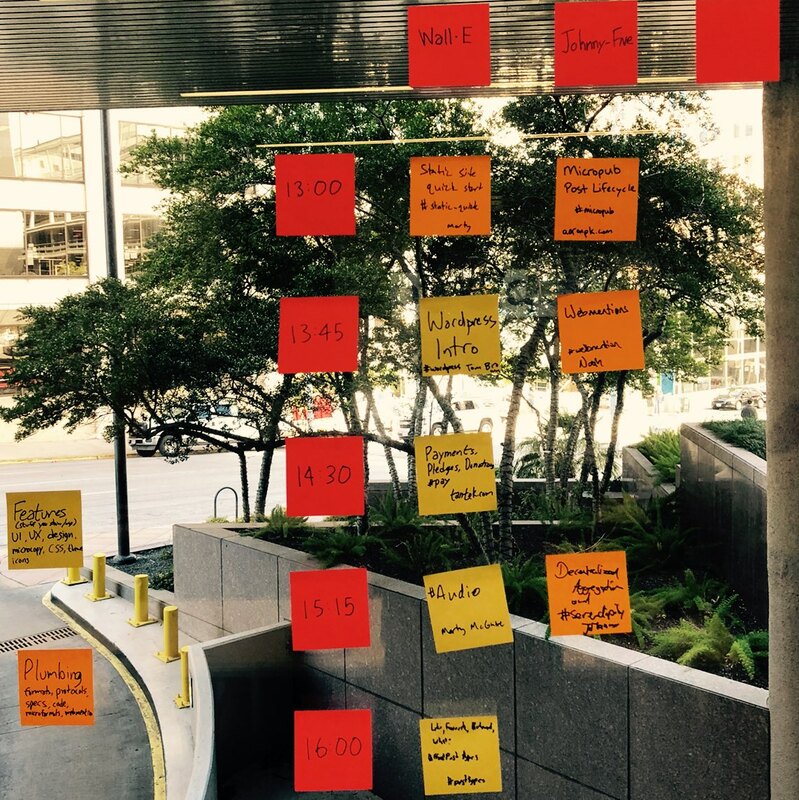 gRegorLove schmarty: Did the schedule get pushed back 15, or just the first session started late and was cut short? schmarty session started late. seems to still be rolling because it started late. tantek gRegorLove can you take notes from what you hear? aaronpk [manton] can you unlock the other door? chrisaldrich audio session: How could we build an audio discovery platform to replace iTunes in a more concerted fashion? IndieNews for audio perhaps? chrisaldrich audio session: it would be nice if more podcasts supported /listen functionality to indicate the number of listeners vs. comments/replies, etc. gRegorLove post type session: imo bookmarks seem primarily for the author first, to find the link later, and optionally for others to discover content. [chrisaldrich] Likes I use to mean thanks or props to the original post or author. [chrisaldrich] Often on Twitter, I'll use the like to convey to the author of a back and forth conversation that I've "seen" their post. [chrisaldrich] and may not necessarily reply directly. gRegorLove what is a chicken? chrisaldrich I suspect part of GWG's issue is that he's writing Post Kinds which "forces" definitions of post kinds for people. [chrisaldrich] To solve GWGs proximal issue, perhaps making the human readable part of his interface definable by the user would suffice. Then each person and site could define their own definitions. [chrisaldrich] I do make active /listen posts for podcasts I'm listening to. chrisaldrich Tantek: I think the tough part of person tags is they're typically an action taken on a piece of content (PESOS) rather than something that feels native doing on one's own site first (POSSE). They might feel more natural if they're done as PESOS with Micropub? chrisaldrich Manton++ for kicking it all into motion! [chrisaldrich] tantek: that's a great point, but I get the feeling that that most of us don't have that interface yet. sknebel chrisaldrich are you thinking about posting them or viewing them?